After your relaxing trip across Lake Michigan on the S.S. Badger carferry, there are many things to do when you disembark in Manitowoc. If you're on foot, you can walk north on Quay Street to 8th Street. Turn left, and here you can grab a cup of coffee at Manitowoc Coffee, get a good book at Book World or take in a show at the Capitol Civic Centre...as well as exploring quaint historical buildings, shops and pubs. Or if you turn to the right and walk across the bridge you can go to the Wisconsin Maritime Museum, Beernsten's Confectionary and Ice Cream Shop, or further up 8th Street you can visit the Rahr-West Art Museum. There are several lodging choices within walking distance, like the Best-Western Lake Front or the Econo Lodge, and many accommodations will provide shuttle services to and from the S.S. Badger (please call lodging in advance to check availability). If you bring your bicycle, you won't have to go far to find the Mariners Trail, six miles of paved trail along the lakeshore that connects Manitowoc and Two Rivers. The trail includes beautiful gardens, sculpture, plus access to the Village Inn on the Lake, the Lakeview Motel, David Martin Pottery Studio, lighthouses, and many more businesses. You can also rent bicycles at many of our local bicycle shops and hotels if you don't have your own. If you bring your car you are only minutes away from museums, restaurants, antique shops, and attractions. In addition to our groomed beaches, you may want to visit Two Rivers and the Washington House (home of the Ice Cream Sundae), the Hamilton Wood Type Museum, or Rogers Street Fishing Village and Coast Guard Museum. 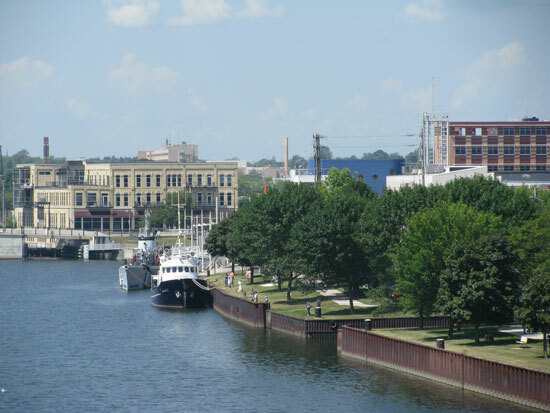 No matter what your interests, the Manitowoc/Two Rivers area has much to offer. For more information, contact the Manitowoc Visitor and Convention Bureau.